"A fast-paced mystery set in the majestic country around Estes Park, with dozens of quirks and turns...Graham brings his knowledge of mountains and climbing into play as his hero, Bender, scales mountains and rappels down mine shafts." "Graham's clever tale is tailor-made for those who prefer their mysteries under blue skies..."
"Description and dialogue balance to bring both the rounded characters and the Rocky Mountain setting alive in this tale of danger, death, and intrigue...Scott Graham has created a satisfying and suspenseful adventure." " Mountain Rampage] combines archaeology education, family relationships, outdoor adventure and taut mystery." "Filled with murder and mayhem, jealousy and good detective work--set against a stunning Colorado backdrop--Mountain Rampage is an exciting, non-stop read. I look forward to more good tales from this talented author." 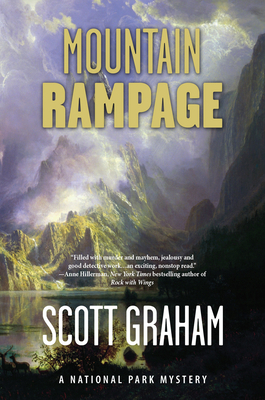 "In Mountain Rampage, Scott Graham delivers taut writing, solid plot twists, a cast of interesting characters, and an appealing protagonist both men and women will love. Get ready for a leave-you-breathless high country southwestern adventure." "Move over Nevada Barr--clean prose and confident storytelling combine to make Scott Graham's second Chuck Bender/National Park Mystery Series novel a must-read for fans of Western outdoor fiction and for mystery lovers everywhere." "In archaeologist Chuck Bender, Scott Graham has created a flawed, all-too-human, and memorable investigator who had me rooting for him to the end." In the riveting second installment of the National Park Mystery Series, archaeologist Chuck Bender finds himself and his young wife and stepdaughters in the crosshairs of an unknown killer when he defends his brother-in-law from false accusations of murder in the brutal slaying of a resort worker in Rocky Mountain National Park. Scott Graham is author of Canyon Sacrifice: A National Park Mystery and Extreme Kids, winner of the National Outdoor Book Award. He is an avid outdoorsman and amateur archaeologist who enjoys hunting, rock climbing, skiing, backpacking, mountaineering, river rafting, and whitewater kayaking with his wife, an emergency physician, and their two sons. Graham lives in Durango, Colorado. Scott Graham is the author of highly praised Canyon Sacrifice, book one in the National Park Mystery Series. Graham's previous book, Extreme Kids, won the National Outdoor Book Award. Graham was raised in the Rocky Mountain town of Durango, Colorado, where echoes of Colorado's violent gold-mining past featured in Mountain Rampage resonate to this day. He has explored the high mountains of his home state his entire life, including numerous hiking, climbing, and backpacking trips deep into the Rocky Mountain National Park wilderness. Graham has made a living as a newspaper reporter, magazine editor, radio disk jockey, and coal-shoveling fireman on the steam-powered Durango-Silverton Narrow Gauge Railroad. He is an avid outdoorsman and amateur archaeologist who enjoys mountaineering, skiing, hunting, rock climbing, and whitewater rafting with his wife, an emergency physician, and their two sons.